A woman from Richardson, Texas, took a crazy idea and turned it into a phenomenon: cats dressed in wigs. 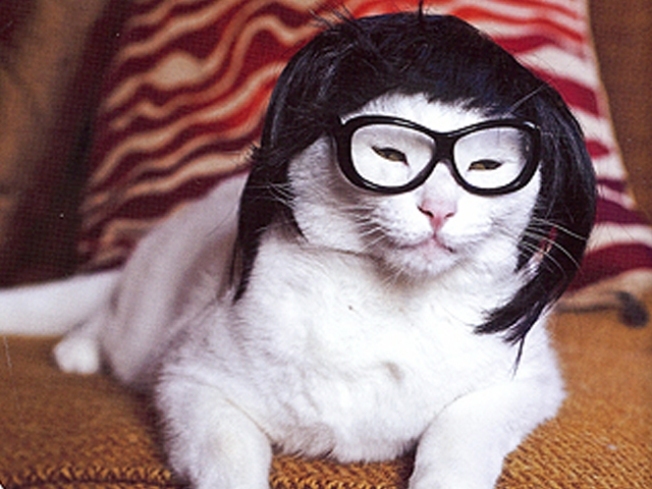 When the Internet-based company Kitty Wigs took off, a book deal followed. Glamourpuss: The Enchanting World of Kitty Wigs goes on sale October 1. Former Star-Telegram photographer Jill Johnson remembers the day a friend proposed the unusual project. "'Would you want to do a book for Chronicle Books on Kitty Wigs, cats in wigs?' And I thought, 'Serious journalist, cats in wigs. Serious journalist, cats in wigs.' So, I did it," Johnson recalled. "And within a month's time, I was meeting cats named Fishstick, Soda, Fern, Chicken, Rooster ... and was hanging out for two months shooting cats in wigs. "It was the funnest time as a photographer," she said. Kitty Wigs is owned by Julie Jackson. "She likes to stay behind the scenes, she's a mystery," Johnson joked. "She's one of those idea people and the difference is, she goes through with it," Johnson bragged as she explained how the idea to sell wigs for cats was born. "There's a lot of dogs that are dressed up and there just aren't a lot of glamorous cat photos out there," Johnson said. "So she just thought, 'What the heck? I'm gonna do this.' And it took off from there." The cats featured in Glamourpuss are all from North Texas. They wore all kinds of wigs: straight, curly, wavy, blue, purple, red, pink, yellow, silver and even rainbow. Johnson learned she needed catlike moves to get the right shots to tell the story. "You have a window of opportunity when you get him or her with the wig on, looking right with all the right elements in it," she explained. "Then you snap the picture. You don't have very much time." The result is a book Johnson hopes will make people smile and simply enjoy the moment. "Something really silly and fun and at the end of the day, (to) not take life so seriously, and that's what it boiled down to," she said.